the steps just let me know and I'll fix it, please do not flame. I know that several of the pictures are crappy and hard to read sorry about this, I'll upload some better ones later. I typed this up really quick and i'll edit it to make it easier to read later. There are two programs you will need to download for this section. 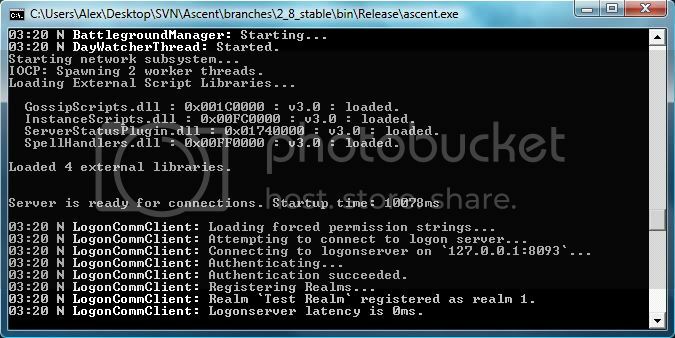 Download | TortoiseSVN - You will use this to download the Ascent source code. Visual C++ 2008 - This is for compiling the source code. Download and install those two then proceed to the next step. 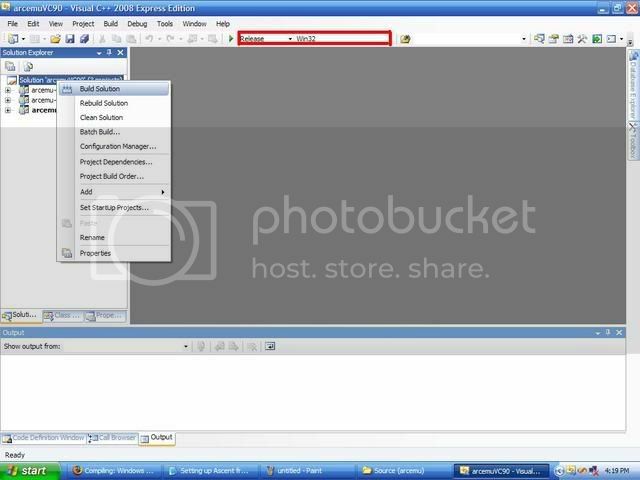 Create a new folder called Ascent, right click and select SVN checkout. nd click ok. It will take a little while to download so let that finish up. While that is downloading here is something else you can do. These steps must be completed. Next, you need to compile the zlib and PCRE libraries. Output_Release. You will find two .lib files called pcre and Zlib. This only has to be done once per compiler! When you update ascent, this doesn't need to be done each time. And this is only needed when using windows. Now you can build Arcemu as normal. By now it should be finished downloading if not then wait until it is. Go into ascent\win (the one you created in step 1.2). 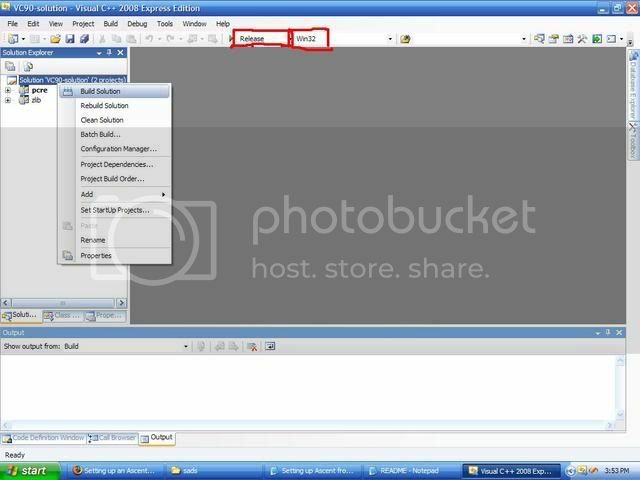 Make sure everything is like it is in the following picture then click build solution. If all went well it should have 3 suceeded and 0 failed. several .dll files in it. 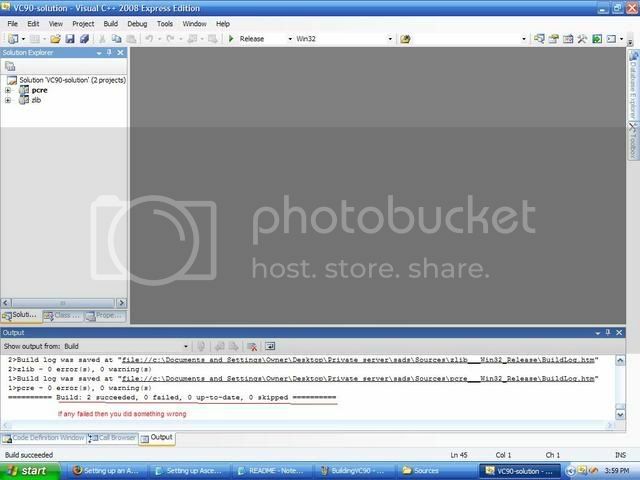 open the solution file scripts2008 and compile it as normal. Once they are done compiling they will be located in ascent\bin\Release along with everything else. 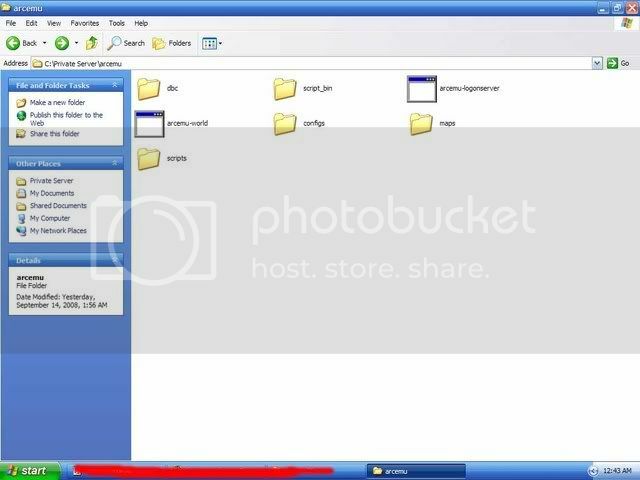 folder (such as C:\ArcEmu). This will be your ArcEmu installation folder. 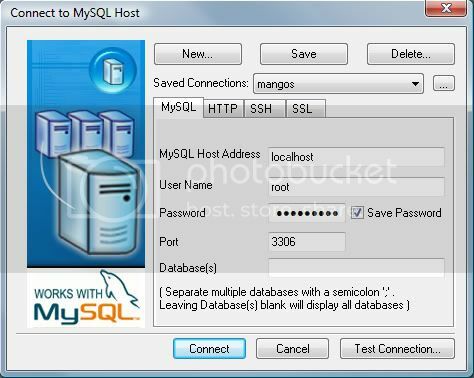 Now install MySQL and select a Typical install. At the end of the install, you will get an option to "Configure the MySQL Server now", make sure this box is checked and continue. When it asks you for a password just press enter. and set the URL of repository to "
below then save and close. you set in step 2.1. Type in I to import files into your database. Once done exit the tool. and click connect when you have done that. 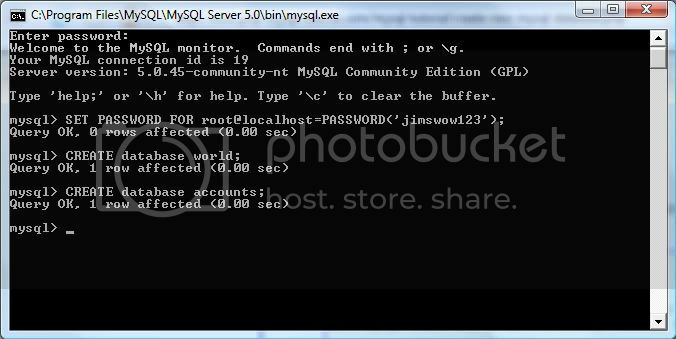 Now right click your accounts database and go to "Restore From SQL Dump". 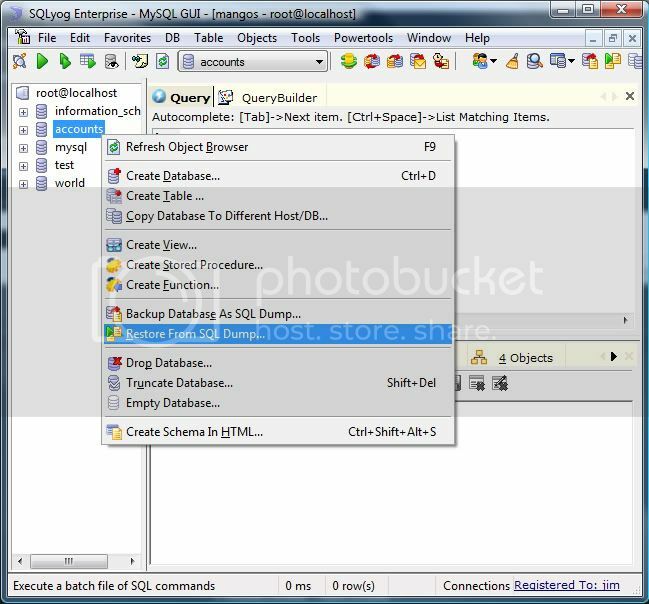 Navigate to your ascent folder and go to ascent\sql and select the logon_structure.sql then click execute. Do the same for character_structure.sql in that folder. or this enGB Map Extractor if your wow client is enGB Place ad.exe into your World Of Warcraft directory, and make a folder in your World Of Warcraft directory called "maps". When the maps have finished extracting, move the "maps" folder to your arcemu folder. Download this DBC extractor and follow the instructions in the readme. The move the DBC folder to your arcemu folder where you put the maps. Now you need to set up the config files you put in the config folder in step 1.3. I am just going to show you the things that you need to change in the configuration files to make the server work, there are alot more options so feel free to explore them. You will need to put in your password in the places that say yourpassword here or password goes here. Find this section and edit it like so. and then save. Launch WoW.exe and play with the game account you made! Please give me feedback on this tutorial, if it was too hard or could have been made easier to understand in parts, let me know. Remember to post problems in the right section! 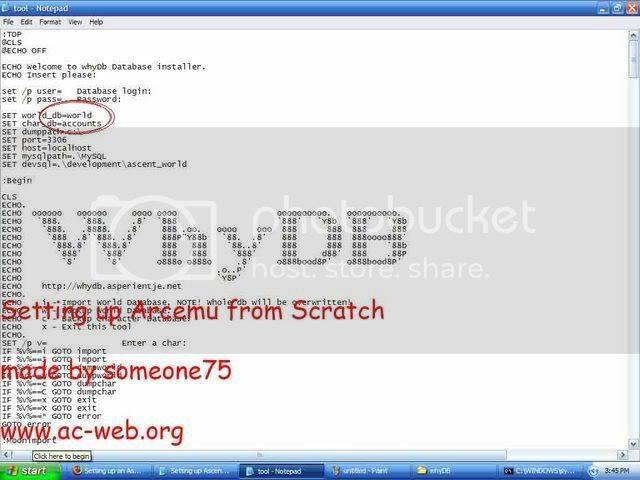 Now when you got your own server up and running (hopefully) , you maybe need to learn some of the Arcemu commands! Note: This thread wod love to be sticky! Thank you mate , this was my first guide. Updated.... Added few adjustments. (sorry spelling) . Somehow i could not edit the "Reserved spot" this time . sorry! I'd appreciate that if you did not steal my guide and then try to claim it as your own. Learn to give credits. Jargs- For making the original guide which this is based off of. i dont care at the fact that you posted it but rather the fact you try to make it look like you did it. I really don't like when people do stuff like that. oh! Sorry Someone75 , you mistake me , i mean i for posting this guide on mmowned . Sorry , changed. Build log was saved at "file://d:Private ServerAscentwinVC90arcemu-logonserver___Win32_ReleaseBuildLog.htm"
You need windows librarys, haveyou got them? You need to get libmySQl from librarys to System32 , also compile the librarys. or else you cannot compile the core. Last edited by Druaide; 08-05-2008 at 08:56 AM. Download the Windows librarys . then read the "Readme" in the librarys , follow it , then compile librarys , and paste libmysql (the new one that you get from compile) , to your C:\Windows , read the guide mate..... but you must compile the library's first! Last edited by Dr. Emu; 08-05-2008 at 11:14 AM. [Epic Guide] Setting Up and Running an ArcEmu Server from Scratch! Setting up an ascent server from scratch.